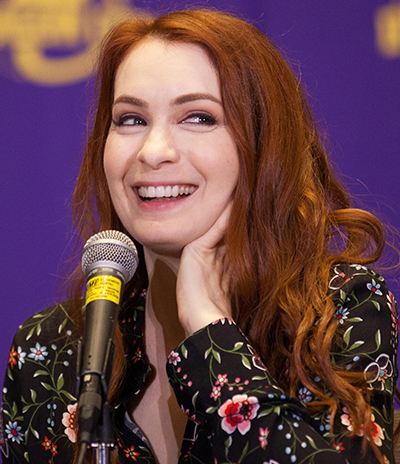 Felicia Day charmed fans at “An Hour with Felicia Day” on Sunday at 10AM in the Westin Peachtree Ballroom, with an assist from her charming “straight” man Mike Capps. This one hour went by so quickly that audience members groaned when time was up. As bubbly and energetic as ever, Day began the panel by asking the audience, “Who went to sleep before midnight?” Unsurprisingly, few people raised their hands. This is Dragon Con, after all. Day admitted—with a grin and a quick reference to such things as video game karaoke—that she didn’t go to bed until after 3AM. Day discussed her current role on Mystery Science Theater 3000 and how she reacts to online comments. She finds it amazing how much she can obsess over a few negative comments. It seems to her that “five [negative] people on the internet outweigh 5,000 [positive].” The first season of the new MST3K had 14 episodes, and Day revealed that the second season will be coming out soon. With a sly look, she said, “I know things.” But, she added, if she told what she knew, her career would go “Kapow!” and blow up forever. Sometimes the funniest things happen when the innocent one-liners are dropped. She innocently mentioned how cool she got “a hot blow torch backstage.” As the crowd roared with laughter, she quickly noted that the torch was for making crème brulee backstage, and she got to use the blowtorch that makes them. She had never done that before. When asked which of the Charlies from her stint on Supernatural Seasons 7–10 was the most difficult, Day chose evil Charlie. “I’m not really a bad person,” she said. “[Evil] wasn’t something I’ve ever channeled before… I’m like”—insert big smile here—“oooo, I’m a happy person!” To portray the character, she drew from some of her not-so-pleasant past experiences, which she wrote about in her book You’re Never Weird on the Internet (Almost): A Memoir. While speaking of those rough times, she said sagely, “When you lose something that’s part of you, you’ll find something to fill it.” Day also said she will be returning to Supernatural in Season 14. And how did she like driving Dean’s car, Baby? She loved it. She is only one of two women that has ever driven it, and she had to steal it to do it. Day loves fairies, sparkly hair, and glitter. After thinking about what cosplay character she would like to be, she decided she’d love to be Daenerys, from Game of Thrones. She also loves furry costumes. “Not in that way,” she joked. She would also like to be Nynaeve, from Robert Jordan’s Wheel of Time books, which she loved despite the bad cover art—with the characters’ limbs far too short for their bodies. Day loves what she does, especially the variety. She started streaming for fun, and Geek & Sundry grew out of it. She loved role playing games, and she was able to help start one. She’s particularly fond of editing, though, because she gets to make other people look good. Day feels lucky to be able to spread her joy to other people. “If I can only spread it to one person, it’s worth it.” As she said farewell, her delighted fans were hoping that she would continue to share her infectious joy for a long time to come.